A tree that sheds poison daggers; a glistening red seed that stops the heart; a shrub that causes paralysis; a vine that strangles; and a leaf that triggered a war. Stewart takes on over two hundred of Mother Nature's most appalling creations in an A to Z of plants that kill, maim, intoxicate, and otherwise offend. 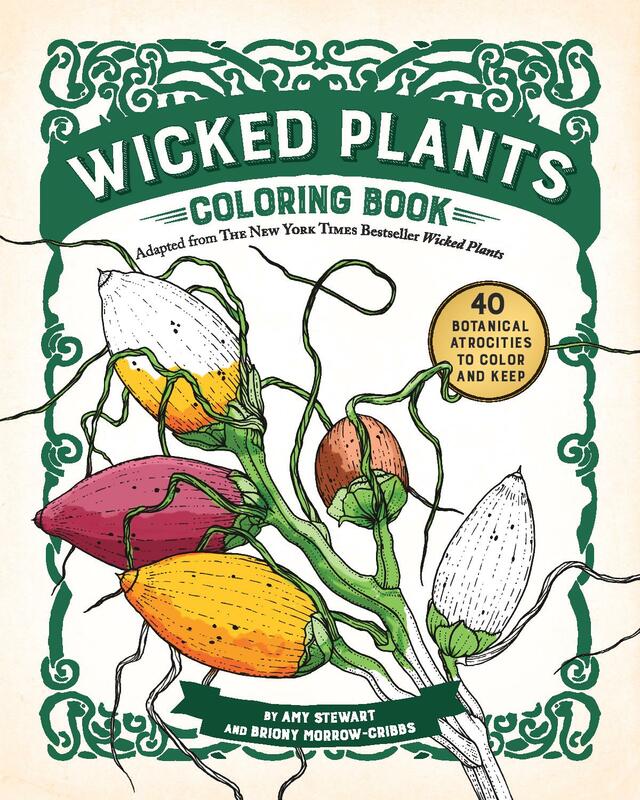 In this delightfully devilish coloring book, Amy Stewart and Briony Morrow-Cribbs bring coloring enthusiasts the forty most menacing botanical atrocities from their New York Times bestseller Wicked Plants. Morrow-Cribbs’s exquisite etchings are now finely rendered coloring-book art and are paired with details from the original book. Drawing on history, medicine, science, and legend--and written with Stewart’s trademark wit--each wonderfully creepy spread offers a fascinating portrait of the evildoers of the plant world, from the vine that ate the South, to the weed that killed Lincoln’s mother, to the world’s deadliest seed. Download fact sheets, Q&As, and other press kit materials. Download a free Common Core-aligned lesson plan for Wicked Plants. Read a Q&A with Amy and and see an excerpt from the book. Wicked Plants has inspired a national traveling exhibit at science museums, zoos, and botanical gardens. "Bram Stoker meets Agatha Christie in this sophisticated little brew of botanical bogeymen." "A fascinating, albeit morbid, nonfiction account of the dangers of poisonous plants... Stewart's compelling style along with the attention-grabbing subject matter will keep gardeners riveted.."
"Wicked Plants Creep Through Brooklyn Garden"
"A state of ease is not what awaits the reader of "Wicked Plants," chapters of which include "This Houseplant Could Be Your Last," "Lawn of Death" and "Deadly Dinner." Browse through it and you will tremble at the sight of a salad. It is, however, a fine gift for owners of country houses who have become altogether too smug about country life." "Deliciously eerie...entertaining, informative -- and a little unsettling." "A practical and entertaining guide to fierce flora...Amy Stewart's guide to the misdeeds of the plant kingdom's most vicious, roguish members may be one of the most fascinating, funny volumes you've come across in ages." "Dangerously addictive ... An entertaining compendium of the plant kingdom's criminal element." "Amy Stewart has done it again...Wicked Plants has crazy Nazi scientists, murderous Russian spies, poison arrows, and plenty of hallucinations...You will be drawn into the stories of plants like killer algae, jimsonweed, and some thing called marijuana. I can t wait for the movie to come out!" 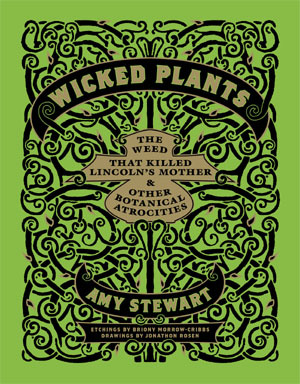 "DARK GARDEN: Amy Stewart's "Wicked Plants: The Weed That Killed Lincoln's Mother and Other Botanical Atrocities" enters the hardcover advice and miscellaneous list at No. 8. Finally, a how-to book that actually teaches something useful!" "Fascinating . . . Visually, the book is very pleasing, with nice old-fashioned text and delicate, detailed black and white copper etched illustrations. Ms. Stewart communicates her love of all things botanical with well-written and witty enthusiasm; her fascination is infectious. This book would be an admirable choice to read while sipping a cold drink (but hold the Hemlock!) in the garden." "Wicked Plants might be more accurately described as a brilliant 'bestiary,' so lively and alive are the rogues, assassins, and ne'er-do-wells of this expertly conceived tome...Everything about this brilliant, fascinating, and often quite funny hardcover screams buy me, down to the elegant book ribbon and the excellent design... Stewart's enthusiasm and her great writing made me an instant fan." "Paging through [Wicked Plants] is like shuffling a deck of Tarot cards, with potential harm and threat on every page." "What makes Stewart's book even more fascinating is that it deftly blends botany, politics, and history into a very appealing format, where botanists will be learning about plants from an historical and legal perspective, while historians can engage in some eco-friendly puzzling." "Nibble at your peril...after reading Wicked Plants, you'll probably - if briefly - look at every inhabitant of your garden with caution...We have new respect for the awesome, often-hidden and sometimes-deadly powers of the botanical world." "Be careful: Stewart's book can be as addictive as the betel nut--but it won't turn your teeth black." A "who's who of fearsome flora...Stewart is so good, as in her previous books, at cutting straight to the most interesting stuff, whether it's about Freud's cocaine use ("In the last few days I have felt quite unbelievably well," he wrote to a colleague in 1895) or the coyotillo berry, whose toxic agents can sit in your system for a week before total paralysis sets in." "Fantastically enchanted . . . Complete with exquisite botanical etchings and whimsical illustrations, it's basically a Hogwarts Herbology textbook, the kind that would've pleased Neville Longbottom very much . . . Wicked Plants never gets boring or twee the way gardening books so often do. Amy Stewart's style is surprisingly badass . . . Best of all, Wicked Plants manages to be simply written, funny, short-winded, and easy-to-read without skimping on magical, historical, botanical, or literary details . . . [Amy Stewart's] one of our coolest chroniclers of the crazy, taken-for-granted magic that lives all around us." "Delightfully macabre...With drawings that illustrate the fate of the incautious, Stewart's original take on the plant kingdom is one worth seeking, if only to avoid its contents." "It's not really about the plants. It's about us. And that's why Stewart's references to "vegetable wickedness," the "devious" coyotillo berry, and "bad boy" hemlock are so amusing and effective... Is Amy Stewart a garden writer or a talented literary journalist who's chosen to write about the botanical world? The answer to that really doesn't matter, as long as she continues to produce books as interesting and entertaining as this one." What’s your definition of a “wicked plant”? I was fascinated with the idea that there are evildoers in the plant kingdom, and that horticulture has a dark side. So I went looking for villains–criminals, lowlifes, miscreants of all kinds. “Wicked plants” include plants that have been used as murder weapons, plants that are illegal or immoral, plants that have started wars, plants that inflict pain, and plants that are badly behaved-they explode, they burst into flames, they smell terrible or destroy other plants in particularly diabolical ways. These are plants you do not want to meet in a dark alley. How did you decide which particular plants to include? Well, there are literally thousands of plants that are poisonous, painful, invasive, intoxicating, and so forth. I couldn’t possibly include them all. So I looked for plants that had an interesting backstory. There had to be a victim–a body count. If a plant killed someone famous, like Socrates or the mother of Abraham Lincoln, I included it. If it was involved in a notorious murder case, like that of serial killer Dr. Thomas Neill Cream, or if it had attacked a person in a particularly gruesome way, it made the cut. So I spent as much time combing through old newspaper reports, obituaries, and medical journals as I did in botanical gardens and herbariums. The people attracted me as much as the plants. A vine alone in a jungle isn’t much by itself. But when a person stumbles into it and realizes it can be used to commit a crime-that’s when it gets interesting! Have you met many of these wicked plants in person? Many of the plants I included are familiar garden plants, like daphne and oleander. In Chicago I found some beautiful deadly flowers, like castor bean and datura, growing in public parks and even spilling out of window boxes at the library. It’s kind of thrilling to see so much wickedness out in the open like that. But some of the plants are rare and hard to find. To see those, I went to England and visited the Alnwick Poison Garden in Northumberland. The castle was used as the location for Hogwarts in the first few Harry Potter films, and the garden itself is wonderfully gothic and frightful. They got special permission to grow cannabis and coca, both of which are imprisoned in wrought iron cages like the criminals they are. I also visited the Chelsea Physic Garden in London, a centuries-old apothecary garden that includes many wicked plants, and a USDA poisonous plant research laboratory in Utah, where they are doing fascinating research about the intersection of poison and medicine. How did the Brooklyn Botanic Garden exhibit come about? I met Scot Medbury, BBG’s president, a few years ago when I visited the garden. They had planted a beautiful, luxurious, and quite dangerous datura in their flower bed. I was enthralled, and I launched into an impassioned rant on the value of exhibiting plants that have interesting histories and checkered pasts. A botanical garden is so much more than pretty scenery-it’s a living museum that can help tell the story of our relationship to the plant kingdom. 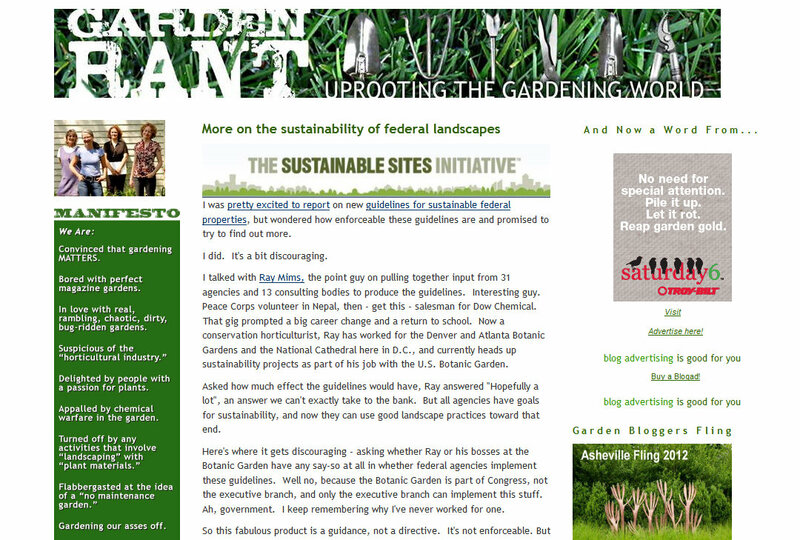 Scot was immediately interested in the idea of planting a garden of wicked plants, and the next thing I knew, we were planning an exhibit for summer 2009. I can’t wait to see so many of my evil darlings in one place! How concerned should people be about poisonous plants in their gardens? Actually, this is a serious issue that deserves more attention. I have friends with small children who will run around covering every electrical outlet in the house, but I can’t persuade them to yank out a deadly plant growing right next to the front door. This in spite of the fact that 3,900 people are injured annually by electrical outlets, while over 68,000 are poisoned by plants. In the back of the book and on my website I list complete reference guides to poisonous plants. If you have small children or pets, I suggest taking a few minutes to look around your garden and make sure you don’t have any dangerous plants that they can get to. And of course, teach your kids not to nibble on unfamiliar plants. Did writing this book cause you to re-think what plants you grow in your own garden? Yes, but not in the way that you might expect. I have to confess that I love a good villain. I really wanted to grow some of them myself. I have a small, fenced-in section of my garden that is not accessible to my pets or the neighborhood kids, and I’ve filled it with poisonous plants. There’s only one plant in the garden that isn’t wicked in some way. People who visit the garden have a hard time guessing which plant is safe. How did you find the artist for Wicked Plants? I saw an exhibit of Briony Morrow-Cribbs’ art at a gallery in Seattle. She does these extraordinarily detailed copper etchings and she makes ‘cabinets of curiosity’ that reflect her fascination with science and the grotesque and absurd natural world. It just so happens that her name, Briony, is also the name of a wicked plant. It was meant to be! What’s the most wicked plant of all? Tobacco. It’s killed over 90 million people. That’s a truly wicked plant. Amazon.com "100 Best Books of 2009" pick, and #1 "Best Home & Garden Book of 2009"
Chosen by the Washington Post and National Public Radio as one of the best gardening books of 2009. Wicked Plants exhibits at Brooklyn Botanic Garden, Tucson Botanical Gardens, San Francisco Conservatory of Flowers, and North Carolina Arboretum. National traveling exhibit launches in 2012, created by the North Carolina Arboretum. Featured on CBS Sunday Morning, on NPR's Morning Edition, and in a special profile in the New York Times. Available on all ebook platforms. 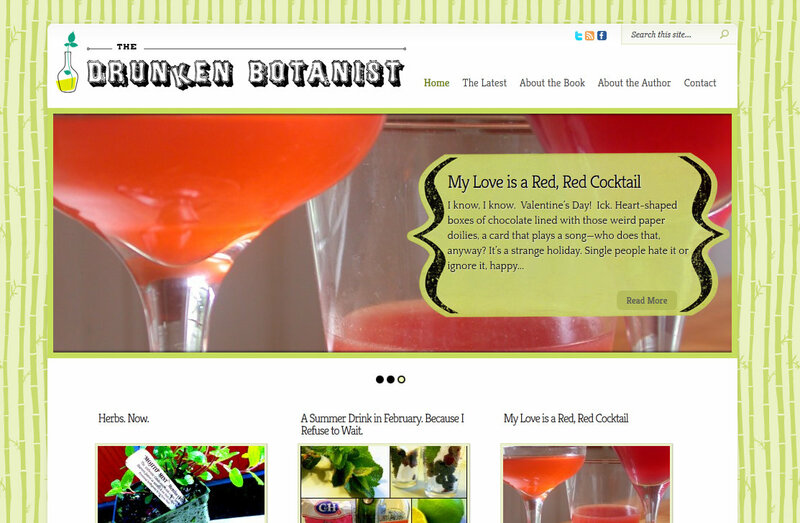 Get cocktail recipes and other extras from Amy's newest book at DrunkenBotanist.com.